After about an hour of running, I reached Chasm Lake. It was mid-morning. There wasn’t a cloud in the sky and the brilliant sun was already baking, fiercely reflecting off the snow-laden flanks of Longs Peak. I had gotten off to a late start, still achy and sleep deprived from a strenuous past week of travel and racing. I’d just returned from a trip to Japan the previous day where I’d ran a tough 50-mile race on Mount Hiei. Despite the circumstances, I was surprised at how good my legs were feeling. 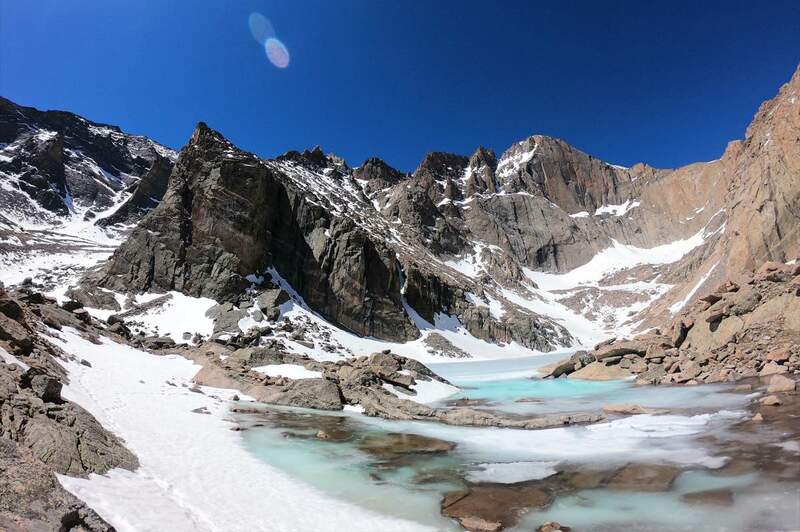 The view of the lake, with the shear east face of Longs Peak towering above, is one of the more stunning panoramas in the state. At this time of year, the spectacle is particularly fine. With the first significant spring snowmelt, the icy perimeter along the lakeshore scintillates in deep turquoise, contrasting with its white snow-covered center. I contoured the lake on the north side to approach the base of the Lamb’s Slide couloir to check out the snow conditions. 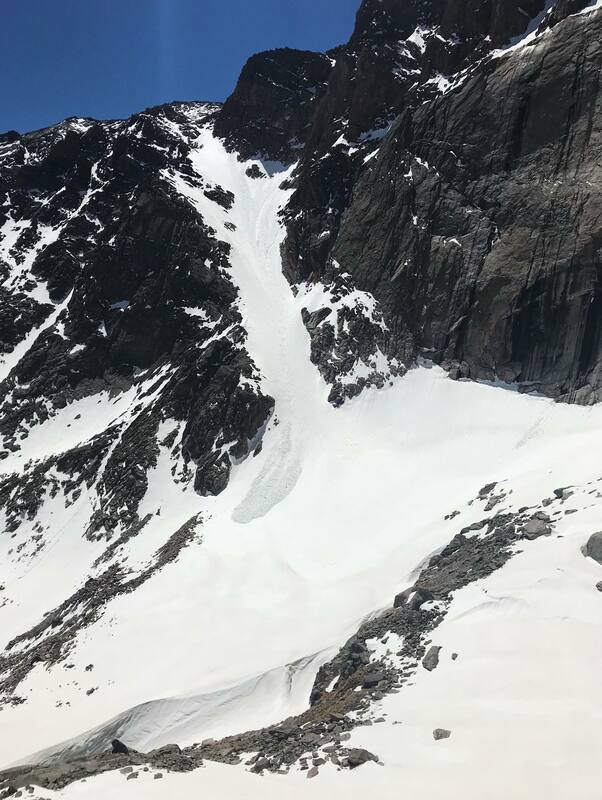 At the bottom, there was a sizeable amount of avalanche debris from a recent wet slide, which nixed any consideration of venturing up that route. Instead, I headed north along the Mills Glacier, progressing along some spectacular wind-formed snow fins to the Camel Gully-–a typically easy option to access the North Face from Chasm Lake. However, with the warming temperature, ascending the steep snow wasn’t a safe option, so I opted to follow a rock rib paralleling the gully, a somewhat tricky route navigating a mix of loose rock and snow. As I climbed, my thoughts drifted back to a recent conversation I’d had with Roch Horton, legendary captain of the Hardrock 100’s Kroger’s Canteen. He had told me the story of Don Jensen, an accomplished and prolific climber in the 1960s. Don wore many hats, one of which was being a mountain guide in the Palisades in California’s Sierra Nevada. Guiding many routes in the range, he knew the place extremely well, but his deep curiosity compelled him to keep searching for new lines and ways to link the abundance of peaks in the area. To that end, he came up with the idea of offering multi-day loops for his more accomplished clients. He named the concept Alpaline Tours for the longer routes and Alpalet Tours for the shorter ones. The vision for these tours was to combine climbing objectives, with scrambling and faster-paced hiking or running to link more extensive terrain in a shorter amount of time. Instead of focusing solely on the vertical world, he took into account the horizontal as well, adding in trails and ridgelines to devise a beautiful experience for his clients. What I find particularly compelling about this concept is that it serves as a bridge between the perspective of the runner and the climber. It shifts our thinking about mountains from a singular viewpoint (trails are for running, walls are for climbing), toward a more all-encompassing mindset. It addresses the space between running and climbing, where the possibilities and aesthetics of a line are considered more in terms of the totality of a mountain range rather than confined to a single trail or wall. This allows us to expand our curiosity into new terrain, challenging us to develop the skills necessary to meet our aspirations. 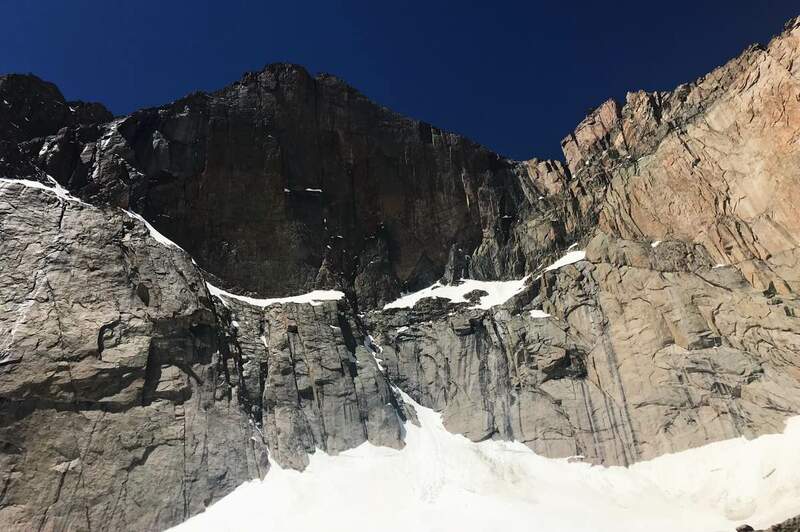 Midway up the Cables Route on the North Face of Longs Peak, having transitioned from running, to scrambling, to a little mixed climbing, it came to me that this outing was shaping up to be a nod to Don Jensen’s original vision and quite the fine alpalet at that. Do your outdoor adventures combine different sports? If so, what do they look like? Like Joe, do you find value in opening your vision of what spending time in the outdoors looks like for you? New ways to move or new routes to travel in wild spaces, do these kinds of experiences bring you joy? I like to remember that the first and best of the English fell runners were “men of the mountain” first and runners second. I think I learned from that that understanding mountains is as important as training in trying to get to the top of them!